Did you know you can go skydiving today, no prior experience required? Tandem skydiving makes the thrill of skydiving accessible to nearly everyone and is the ideal method for making your first skydive. 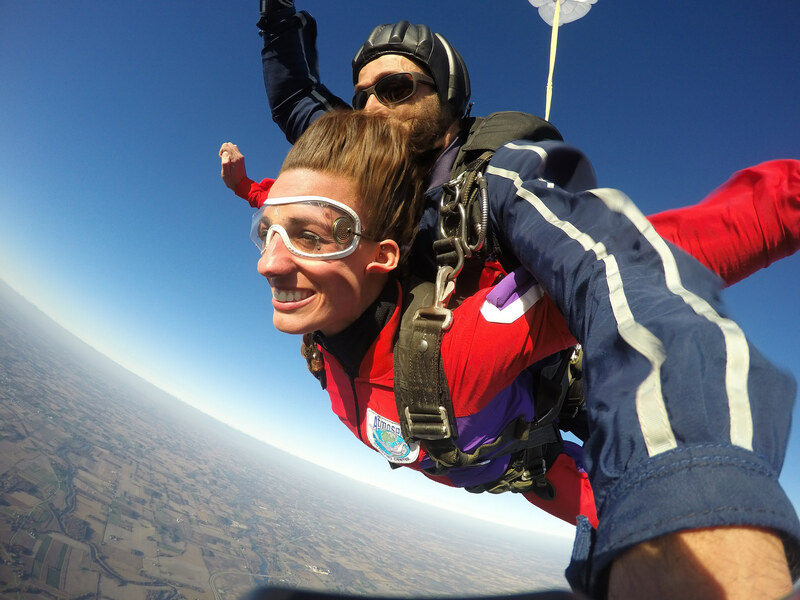 Watch the video below to see what it’s like to go tandem skydiving in Wisconsin at Wisconsin Skydiving Center. For Tandem jumping, plan on spending up to four or five hours here. There are lots of things to watch and activities to participate in while onsite. We encourage you to use our gas grill, bring coolers with food and beverages, and make a day out of it if you’d like. Skydiving is dependent on weather factors so don’t make any plans for after your jump unless they can be postponed if necessary. For your comfort, try not to wear anything bulky, layering is better. We will provide you with a jumpsuit to put on over your clothes. Eat a light breakfast or lunch before your skydive. It’s not a good idea to skydive on an empty stomach. Most people always wanted to skydive but didn’t have anybody to do it with. As you tell your friends and family that you are going skydiving, many will want to join you, encourage them to come with you. Skydiving is more fun if surrounded by your friends and family. WSC also offers special group rates so you can also save money by jumping together! We accept cash, Visa, Master Card, and Discover. Please note there is a 4% convenience fee added to credit card transactions. Please visit our Tandem Skydiving FAQ Page to find answers to other commonly asked questions.